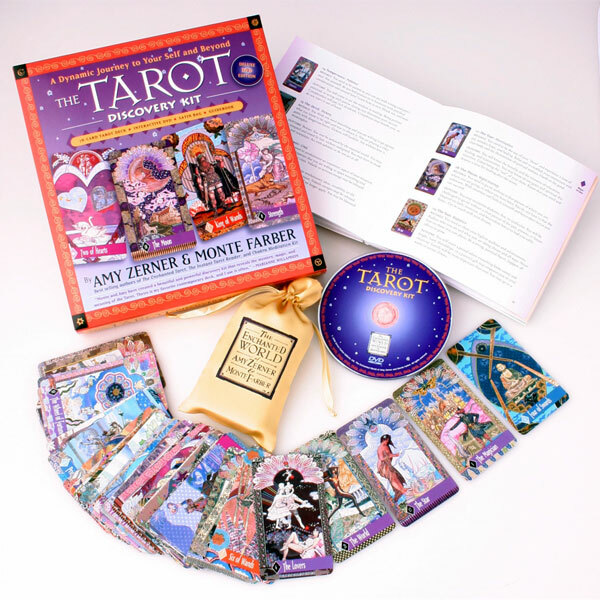 Amy Zerner, who was featured last month in our “Mind Body Spirit Artist Series” has co-created “The Tarot Discovery Kit” with her husband Monte Farber. 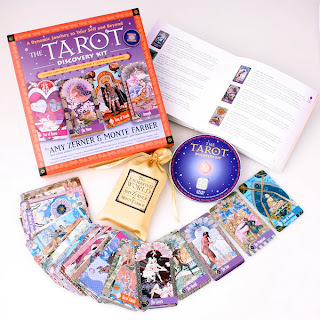 This wonderful kit is about more than just tarot though. It also contains ways to help you ground and focus your thoughts, as well as meditating on a myriad of subjects, to help you reach a deeper truth. The kit contains a deck of cards, a booklet, and a DVD. For the most part, the cards follow a standard format. The four suits are as usual (wands, swords, cups, pentacles). The court cards contain four of each suit, Princess, Prince, Queen and King. The cards are kept in a golden satin pouch. The booklet goes into the detail of each card in the deck, complete with the message behind the card, and the outcome. As well as describing the cards in detail, the booklet also offers you a second usage of the cards that I have not seen in other decks. These cards can also be used for meditation. Each card has a different concept on which you can meditate, such as “intuition”, “discipline”, or “patience”. The main menu of the DVD is divided into six sections. One for the Major Arcana, and one for each suit. These sections are used with the meditation aspect of the kit. The final option is “Tarot Discovery Theater”. This section contains features on the Major Arcana, the Minor Arcana, the history of tarot, entering sacred spaces (how to use the power within us), and a grounding ritual to help prepare your mind for reading the cards or doing your meditation exercise. In addition, the Grounding Ritual is very therapeutic and can be used all on its own, whenever you just need to take a moment and relax and center yourself. That always gives us a much stronger position from which to deal with things. As mentioned previously, this deck follows the standard suits, so those of you that are comfortable doing readings already should be able to jump right in. You just have to remember that there are slightly different court cards than usual (using a Princess and Prince rather than a Knave and a Knight). Also know that there are no reversals involved. Each card has but one message and one outcome. The booklet gives you details on a One-Card Spread as well as the standard Celtic Cross Spread. Advanced readers can play with other spreads with which they are familiar to see which ones work best for you. These cards are very beautiful and ornate. For those of you who are just starting out, these cards may be too ornate for you to use as a starter deck. Those of you who are experienced are given a wealth of imagery on the cards from which to draw your readings, much more so than an average deck. 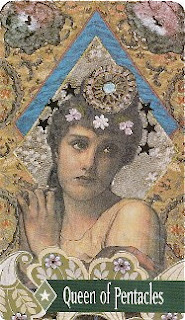 While the cards may be too ornate for some to use in a reading, that same ornateness becomes a strong point when it comes time to use them for meditation. In order to perform the meditation rituals, you will need the cards, the DVD, and possibly the book, depending on the kind of meditation you wish to do. If you wish to let your mind inform you of the meditation it wishes to do, then use the DVD to go through the White Light Illumination ritual. As you go through the ritual in your mind, shuffle the deck and choose a card at random. Once you have made your choice, study the card, its colors, its symbols, absorb as much as you can from the card. Then, go back to the DVD and find that card in its section. Listen to the words and music and focus on all the aspect of the card that you can. Take it all in. At the end, focus on the impressions you are left with after going through this, and relate it to the card you chose. This will complete your meditation. If you wish to choose a specific topic on which to focus your meditation, you can go to the booklet. It explains the meditation concept for each card. Once you have made your choice, you can go through the steps outlined in the previous paragraph, minus the shuffling of the cards and choosing one at random. All other steps in the process remain the same. The wealth of imagery on each card could lead you to use the same card in multiple meditations, and get new and interesting insights each time you use it. So, whether you need to a standard reading, an advanced reading, a chosen meditation, an internally informed meditation, or even just a basic grounding ritual for better centeredness and focus, this kit will help you.